HexGrate is a hexagonally formed rust or mesh, specifically developed as areinforcement of different fire-proof linings and ground surfaces.It is used as a thin-walled anchorage system to retain thepositioning of fire-proof and refractory materials. In addition theupper stratum or surface of the lining is stress relieved whenusing HexGrate. Crack formations and spalling are thereforeprevented. 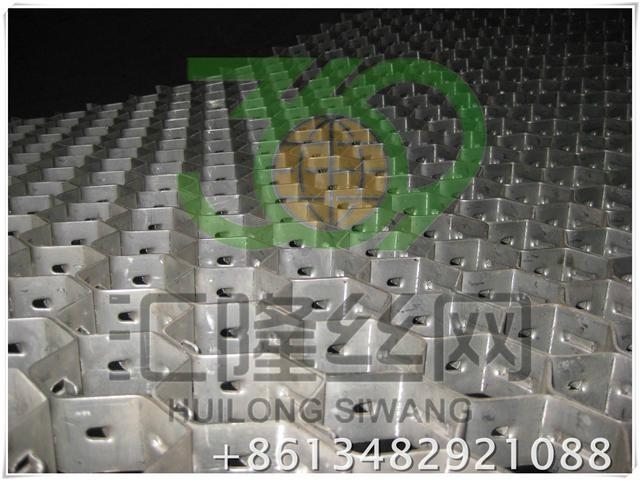 Through the stability of HexGrate and in collaborationwith its special design a reduction of attrition or respectivelyabrasion can be achieved. This means a substantially longer servicelife. The special riveting technique of the individual HexGratestaves, allow it to be adapted to many different forms. It can berolled down to a diameter of D = 550 mm and be adjusted toalmost all possible geometrical forms. Additionally a very highabsorption of high temperature fluctuations is guaranteed due tothe flexible riveting technique. It is ideal for a wide range oflinings, for example cyclones, reactors, and for almost all formsof equipment which are exposed to high temperatures. According to your information and drawings. Edge surrounds or cambered down to a diameter of D = 550 mm. All HexGrate fastening parts are part of our delivery program. All heat and acid-resistant material E.g. Special materials are available on request.